TBI Convenor Martin Sherring starts us off with some stories of his and Penny's recent cycling trips. Adventures come in all shapes and sizes, and what seems adventurous to one person is mundane to another. But whatever feels adventurous to you, the Highlands must be about the best place in the UK to start, whether your taste is for snow, sea or mountains. Penny and I have been exploring some cycle routes over the last few years, and particularly enjoyed two trips where we simply set off from home on our bikes. 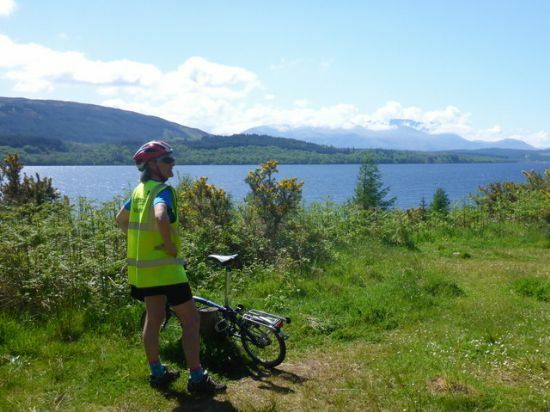 Both trips used Sustrans’ National Cycle Network – the first focusing on NCN 1, which goes across the Black Isle on its journey from the Shetlands to Dover, and the second using NCN 78 from Inverness to Campbeltown. This was our first multi-day bike tour for over 30 years. The total distance is about 200 miles, and we thought we could manage 50miles a day in reasonable comfort, so we booked places to stay in Forres, Banff and Pitmedden. We booked trains for the return journey, packed some maps and a change of clothes, and off we went! It was October, so no real surprise that the weather was a bit mixed, but the Moray coast was spectacular, and the route across Aberdeenshire continuously interesting. The whole route was remarkably traffic-free (even through Aberdeen - except for a short distance along Union Street!) and the Sustrans signs made route-finding easy. As with any adventure, there were a few tough bits – cycling out of Aberdeen into a southerly gale, it felt as if we’d never make our 50 mile quota that day – but mostly it was great fun, and even on the hard bits we got a sense of exhilaration from battling through the wind – and a sense of achievement from travelling so far under our own steam. At 280 miles, this was a bit longer, and maybe because of that we were a bit more worried about getting the planning right. Once again we worked on an average of 50 miles/ day, but the overnight stops don’t fit so easily into 50 mile sections. At first we planned to travel south-west to north-east to catch the prevailing winds, but at the last minute we realised we were in for a prolonged period of north-easterlies, so we changed our minds. We were travelling in June, so we wondered about camping - it would have freed us from pub meals and given some more flexibility – but would also have meant quite a lot more weight to carry. 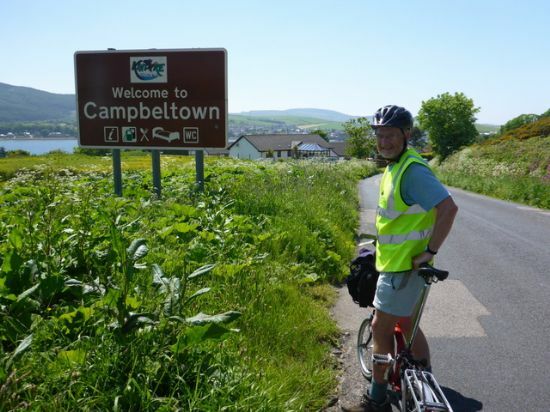 The return trip needed some thought too – booking bikes on trains is hard enough, but trains don’t go to Campbeltown, and getting any clarity on which buses can take bikes turned out to be really difficult. Meanwhile we had bought Brompton folding bikes, and that made the return journey much easier – but they aren’t the obvious choice for travelling long distances! The final compromise was to take the Bromptons, travel light, stay in B&Bs, and get the bus back – and that worked fine, although we got a few comments about the bikes! So, with accommodation booked, we set off one afternoon, aiming to stay with friends on the south side of Inverness to give a short first day on familiar roads. We thought the south side of Loch Ness was familiar too, but somehow the scenery seemed new and more interesting at bike speed. 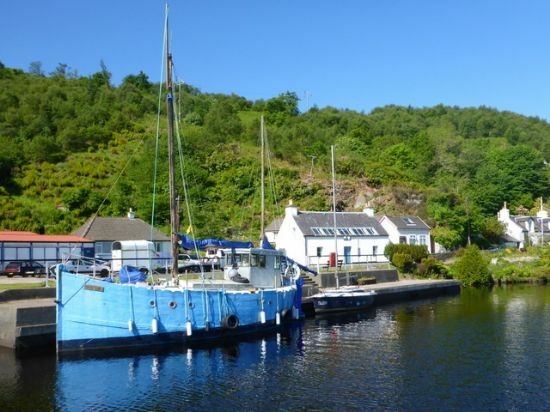 This first day to Fort Augustus was quite short and we arrived with plenty of time to explore the canal and locks. Next day we were mostly off-road, with fantastic views of the Grey Corries, to our next B&B in Fort William, then under the great mass of Ben Nevis, on a mix of quiet roads and cycle paths down Loch Linnhe then cross-country to Connel. The next day we headed inland, with great views of Ben Cruachan, then a lovely section along Loch Awe. From there we had our longest day, with the character constantly changing. We started along the easy flat ground and historic interest around Kilmartin, followed by the towpath along the Crinan Canal, and then Kintyre with fantastic views of Jura. Finally our last day, from Tarbert to Campbeltown, with more sea-side views, of Arran this time. Our little adventures won’t be everyone’s cup of tea. 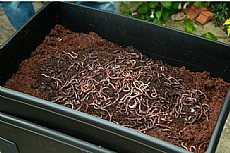 We really enjoyed the sense of simplicity and self-sufficiency we got starting from home, but there are lots of alternatives that start with a drive or a bus. In fact, there are so many options, sometimes it seems the hardest thing is to decide what this year’s adventure should be – but this is a great time of year to get the maps out, light the fire, pour a cup or a glass of something nice, and spot those places you’ve never got round to visiting. Happy adventuring!